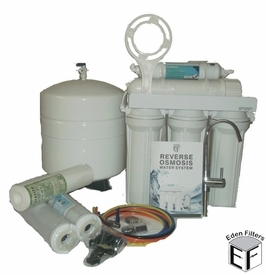 The RO5-100 Reverse Osmosis (RO) water purification system has a production capacity of 100 gallons per day. 1st Stage: 5-Micron Polyspun Filter Cartridge 2.5x10" (replace every 12 months); removes dirt, suspended particles and rust. 2nd Stage: 10-micron Carbon Block Filter Cartridge 2.5x10" (replace every 12 months); removes chlorine and VOC. 3rd Stage: 10-micron Carbon Block Filter Cartridge 2.5x10"(replace every 12 months); removes residual chlorine and VOC. 4th Stage: 100 GPD TFC RO Membrane (replace every 2 years); removes all contaminants and reduces dissolved solids by up to 95%. 5th Stage: Inline Carbon Post Filter 2x10" (replace every 12 months); provides final polishing of water after the storage tank. The System comes with lead-free modern faucet with chrome finish, 3.2-gallon pressurized tank , color-coded tubing, and an installation pack. The installation pack includes tank ball valve, feed water valve, drain saddle, inserts and screws, housing wrench and the installation manual. The system has one important component, an auto shut-off valve, which eliminates wasted water by closing the feed line when the pressure tank is full. This system makes less waste water than other RO systems - 3:1 ratio. Note: The wrench is unique. It is used to open filter housing, membrane housing, 1/4" nuts and quick fittings. The purchase of this product also comes with one year limited warranty on all parts. 12-MONTH REPLACEMENT FILTER KIT IS: RPL4-RO5-100. RO Unit Dimensions: 15 x 8x 18" H "fits under most sinks"
Reverse osmosis, a membrane-technology separation method, together with carbon adsorption (in pre and post filters) will remove most contaminants from water. Easy installation under the sink or mounted on the Wall. Most places will meet major requirements for installing an RO system. Filtering water at home means minimizing the use of plastic bottles, thus, helping the environment.